So how is the Solar PV market doing? What is its future? How is the US market doing compared to other countries in the world? Well, lets take a look. 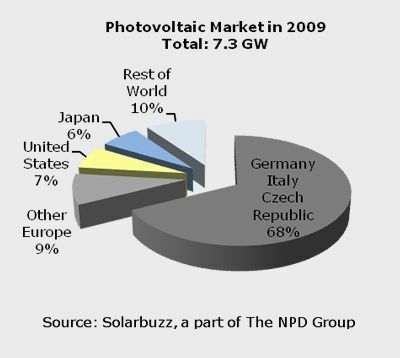 World solar photovoltaic (PV) market** installations reached a record high of 7.3 gigawatt (GW)* in 2009, representing growth of 20% over the previous year. Just for comparison, in 1985, annual solar installation demand was only 21 MW. I'm a visual learner. So here is chart on the solar energy consumption of major countries in the world. It is safe to say that Germany is leading the solar energy race compared to other countries in the world. Cumulative solar energy production accounts for less than 0.01% of total Global Primary Energy demand. Solar Energy demand has grown at about 30% per year over the past 15 years (hydrocarbon energy demand typically grows between 0-2% per annum). Take a look at the charts below for a better understanding of where the solar energy stands in the global energy share. So although 0.01% doesn't seem like much, according to SolarBuzz, a site dedicated to global solar energy industry, its research confirms that the Asia Pacific, Europe and US all are projected to have strong growth over the next five years. The marketability of solar energy highly depends on the DNI index. Obviously we can only market solar energy where there is plenty of sunshine. Below is a map of where we get most amount of sun. 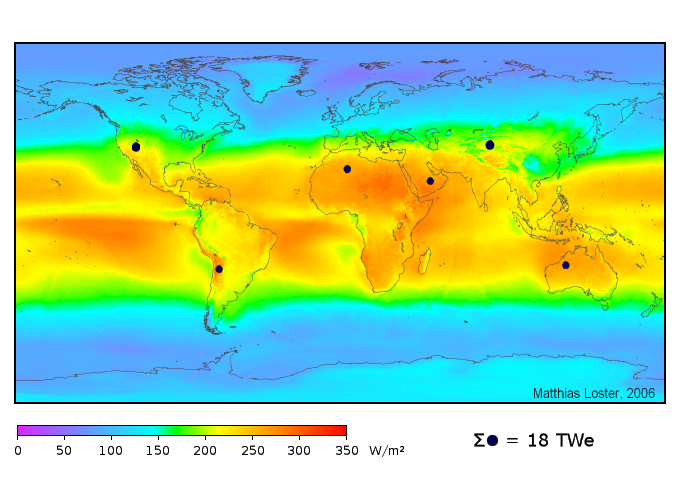 It obvious to see that the equatorial belt gets the most amount. Currently in U.S. the solar energy industry has been booming in California, Nevada, New Mexico, Arizona, and Western part of Texas (you can see this for obvious reasons). California has been the leader in residential solar energy. 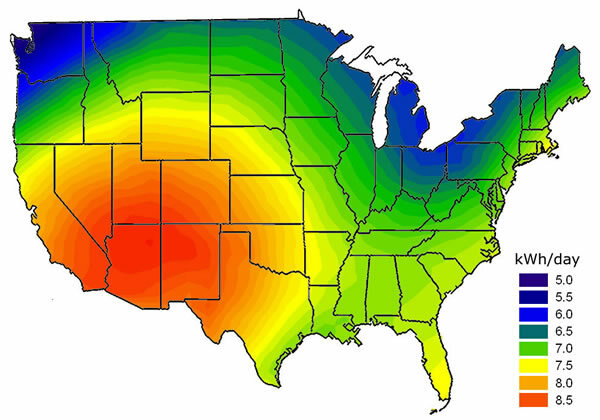 There are other states such as New York, New Jersey, Florida, and Colorado that are quickly catching up to the solar energy demands. 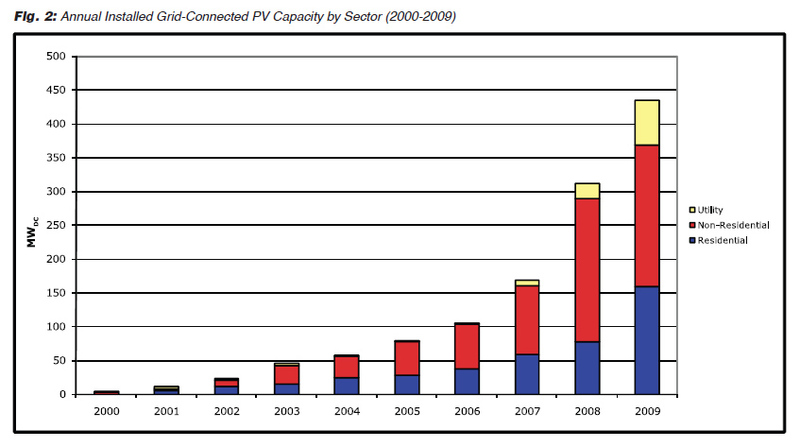 Please take a look at the chart below for the growth of the U.S. PV market over the past decade.It is clear that the market is going to explode upwards in the next few years. 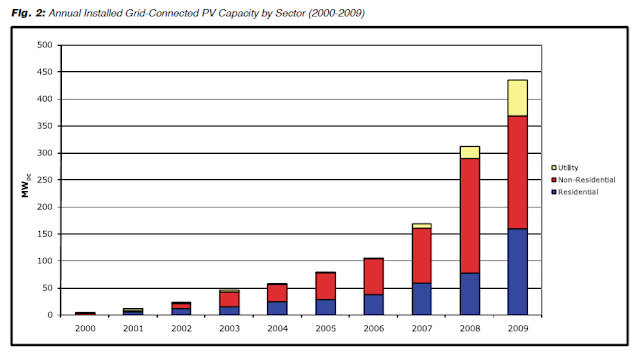 More Solar: The number of solar systems installed increased by 18% in 2009 from 2008. Residential solar’s leading the way: Residential solar photovoltaic capacity doubled in 2009 since 2008 and represents 36% of all new grid-connected PV capacity. The non-residential sector experienced no growth. Growth by State: California represents about half of all the solar PV capacity installed in the United States in 2009. In 2009, grid-connected solar PV capacity in New Jersey increased by 155%, in Colorado by 8%, in Arizona by 243%, and in Massachusetts by 174% from 2008.